Four Seasons Hotel Gresham Palace Budapest launches a truly unique dining experience and invites its guests to discover the Hungarian State Opera House in Four Seasons style. The Opera House - one of the most beautiful Neo-Renaissance buildings in Europe - is considered to be among the best opera houses in the world in terms of its acoustics, and has an auditorium that seats 1200 people. It is horseshoe-shaped and has the third best acoustics amongs similar European venues such as La Scala in Milan and the Paris Opera House. 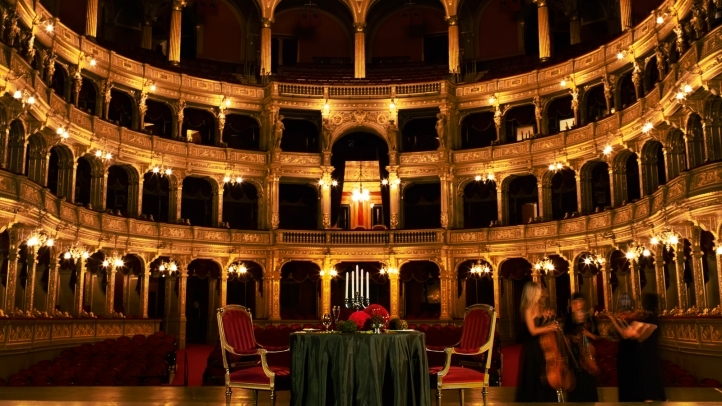 The onstage private gourmet dinner is exclusively created to offer a �once in a lifetime� experience. A Four Seasons limousine takes guests to the Opera House, where guests may expect a grand entrance into the opulent foyer with its vaulted ceiling, grey marble columns and sweeping staircase. A perfectly set table is already waiting in the middle of the grand stage with an exquisite five-star meal created by Executive Chef Leonardo Di Clemente. Guests will enjoy a mysterious atmosphere of the stage surrounded by a fascinating scene while being delighted with gourmet dishes such as sea bass with black olives and veal fillet Rossini style. Musicians and singers will provide entertainment for a glorious combination of music, theatre, and dance. This new experience is available exclusively to individual guests and groups of the Hotel or the Gresham Restaurant. To book, contact Reservations on + 36 1 268 6000 or email rfp.budapest@fourseasons.com. This December �tis the season to celebrate in Turks and Caicos when Blue Haven Resort and Marina is unveiled as the newest luxury property in this in-demand Caribbean destination. Blue Haven will be the only resort and marina in Turks and Caicos and the ideal backdrop for special celebrations. Located in the Leeward area of Providenciales, a quiet alternative to bustling Grace Bay Beach, Blue Haven will feature 35 suites and 16 premier guest rooms, three dining venues, a spa with four treatment rooms and the already-opened 78-slip, state-of-the-art Marina which can accommodate yachts up to 220 feet. With its extraordinary indoor and outdoor venues and views of white sand beaches, azure water and luxury yachts, Blue Haven will provide an exceptional location for destination weddings, family reunions, birthday celebrations and corporate and incentive retreats. The resort can accommodate special event groups of up to 150 people and will provide catering and event and activity planning services. Premier event venues include the waterfront Gazebo perched above the electric blue sea, the luxurious Penthouse Suite featuring a 2,000 square foot terrace, or the resort�s open-air restaurant Fire & Ice, which will feature a world-class, yet laid back ambiance and exciting culinary adventures. Additional venues include the resort�s beach, beside the infinity edged pool or at SALT, the Marina front eatery featuring a casual setting perfect for barefoot f�tes. As the �Gateway to the True Turks and Caicos Islands,� guests will delight in a wide variety of outdoor adventures. The world�s third largest barrier reef is just a short boat ride from Blue Haven providing unparalleled scuba diving and snorkeling. Turks and Caicos is also a top destination for deep sea and fly-fishing with some of the most popular spots close by to the Resort. Kiteboarding, stand-up paddleboarding and kayaking excursions will be available directly in front of Blue Haven. On-site land activities and amenities at Blue Haven will include horseshoes courts, beach volleyball, bocce ball, outdoor BBQ areas, a complimentary 24-hour fitness center, the Marketplace where sundries, wines and gourmet delicacies may be purchased, a seaside infinity pool with swim up bar and a stretch of fully-serviced white sand beach dotted with cozy chaise lounges and hammocks. A fully equipped conference center with meeting facilities will also be available which will place Blue Haven in the forefront as a top corporate retreat, meetings and incentives destination in Turks and Caicos. Nightly rates at Blue Haven Resort and Marina start from $300 to $1,950 depending on season of travel and type of accommodation booked. For additional information about celebration retreats at Blue Haven Resort and Marina or to book reservations, please visit http://www.bluehaventci.com/ or call the Resort: (649) 946-9900; or Marina: (649) 946-9910.